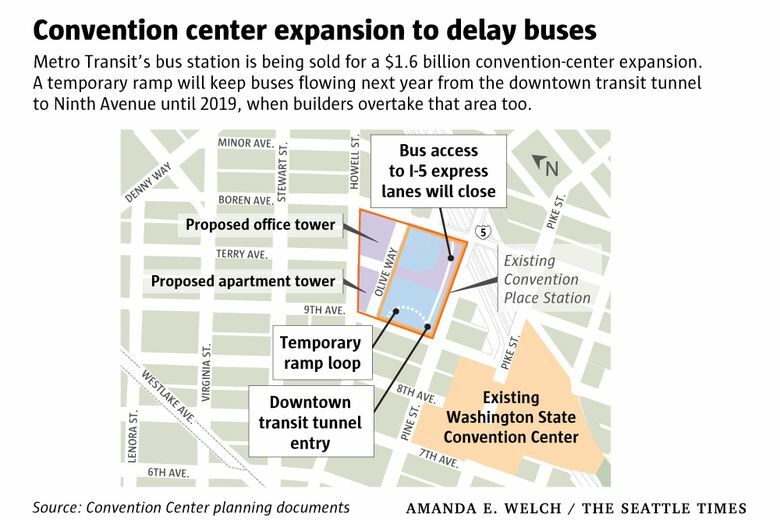 Delay in convention-center expansion adds time for tunnel buses, but that’s just one project in coming years that will likely worsen downtown Seattle traffic clogs before new light-rail stations open. People traveling through Seattle will catch a rare break when the Metropolitan King County Council votes as early as Monday to let buses remain in the downtown transit tunnel until sometime in 2019. Despite this reprieve of up to one year, bus detours and worse congestion will happen sooner or later. How much hassle will people endure? Can government agencies make a useful plan to move traffic? • Ferry terminal rebuild: Starting in Augustand finishing in 2023, to cause detours on and alongside Colman Dock. • First Avenue streetcar: Rails and new concrete to be installed in center lanes from 2018-20, if federal transit grants aren’t slashed by President Trump’s budget proposal. • Madison Street bus-rapid transit: Includes a downtown loop where Alaskan Way meets Madison and Spring streets. Construction early 2018 to late 2019. • Highway 99 tunnel completion: Tube bypassing downtown may open sooner than early 2019 schedule. Permanent closures of Alaskan Way Viaduct, its mid-downtown and Belltown exits, and Battery Street Tunnel. • Viaduct demolition: Expected in 2019 after tunnel opens. Will cause cascading street closures. • KeyArena renovations: Oak View Group’s proposal, if approved, calls for construction January 2019 to September 2020. • Waterfront Alaskan Way: To be rebuilt with promenades, more lanes and bike trails in 2019-23, after viaduct demolition. • SLU street grid: Harrison, Thomas and John streets to be extended across Aurora Avenue North in 2019-21 after tunnel opens. Convention Place Station will be sold to the county-owned convention center authority for $161 million, to go toward transit operations. The $1.6 billion expansion will double the center’s size, while housing and office towers rise across Olive Way. Land clearing could begin in late 2018. The sales deal would evict hundreds of buses a day from the downtown transit tunnel onto city streets by March 2019 if project permits arrive by July 1, 2018 — or September 2019 if permits take longer. Convention-center supporters say the boost in tourism and the construction work is worth the sacrifice that commuters will face. County Executive Dow Constantine in March proposed a bus ouster as early as October 2018 in the sales agreement. Developers now don’t think city permits will arrive soon enough to allow that. Construction will block a direct Interstate-5 express lane ramp for buses, and fill Olive Way beyond capacity. Also in the 2019-23 time frame, the Alaskan Way Viaduct will be demolished, the downtown ferry terminal and surface waterfront boulevard rebuilt, and more streetcar tracks installed, even as thousands of office and housing units keep sprouting. It all adds up to more congestion downtown, before Sound Transit can offer some relief by opening its Northgate, Roosevelt and U District light-rail stations. Those stations won’t open until 2021, with long four-car trains. “They talk about a few minutes more. My experience with traffic is, it could take a lot longer,” says Marci Carpenter, who is blind and leads a city transit advisory board. She already spends 20 minutes on a bus from I-5 to Third Avenue in the Stewart Street corridor. County officials are unlikely to wait longer. Instead, a broad traffic-planning effort called One Center City is underway. As a result of the bus-tunnel closure and other projects, Metro will change some routes so that riders transfer from buses into trains to reach downtown, instead of sitting through delays on congested streets. More buses using Highway 520 will stop at UW Station at Husky Stadium, where the train reliably reaches Westlake Station within six minutes. An all-bus trip that’s now 32 to 46 minutes from the Eastside to south downtown would take 38 to 54 minutes two years from now on that same route. But riders could make the trip in 30 to 41 minutes using both bus and train, a Metro infographic says. “It’s going to be more convenient for some, and less convenient for others,” said Metro deputy general manager Victor Obeso. To keep 520-corridor buses from being swallowed by downtown traffic, Metro is considering a couple of options after the UW Station stop: The buses could go another mile to the University District and return east, or proceed to South Lake Union. Obeso urges riders to take an online survey and make comments. Traffic would be a hindrance through the Montlake Bridge as buses head from 520 to the UW Station. After that, would buses stop in a road lane next to the train entrance? Enter UW parking lots? Stop in bigger stations or shelters across Montlake Boulevard? “How do you create a situation where people aren’t angry, where they can make a seamless transfer?” said Shefali Ranganathan, executive director of the Transportation Choices Coalition. Likewise, some buses from the south and west would stop at Pioneer Square Station, and continue up First Hill. The West Seattle C Line will continue traveling to South Lake Union. An average 570 buses use Convention Place Station during six peak hours each weekday. They use it to reach the direct freeway ramps, continue on Olive Way, make downtown tunnel trips, or park for driver breaks known as layovers. The convention-center project will push those buses elsewhere. Without street improvements, buses on Fourth Avenue would take 3½ more minutes to cross downtown, agencies say. Some ideas to relieve transit congestion have already fallen by the roadside. Fifth Avenue, which is mainly a general-traffic route south to I-5, will not be converted into a three-lane bus corridor as suggested last winter. That change might require $28 million and more time than planners have. Nor will agencies pursue the alternative, striping a second bus lane onto northbound Fourth Avenue. “One Center City Now Recommends Bare Minimum for Transit,” said a headline at The Urbanist blog this month. Scott Kubly, director of the Seattle Department of Transportation (SDOT), said another bus lane on Fourth “didn’t perform” in studies. Buses already use a general lane to leapfrog other buses, he said. “Basically what you saw was a marginal improvement in travel time to the bus, but a huge detrimental impact for cars,” Kubly said. Signals will be rearranged to help keep buses moving, he said. He sounded determined to build either a two-way bike lane on Fourth, or a pair of one-way bike lanes on Fourth and Fifth. Adding a second bus lane to Fourth would eliminate the space to create a protected bicycle lane on the left side, he said. What’s being done to provide relief from the expected congestion? The convention-center sales deal calls for a temporary, $4 million loop ramp on the west edge of the site, to let buses use the tunnel and pour onto Ninth Avenue during the first year of land-clearing and construction — instead of being pushed out immediately in 2018. Once buses are removed from the tunnel, light-rail trains should be more efficient, crossing downtown in nine minutes instead of 11 minutes. Officials propose all-door loading for buses on Third Avenue, not just RapidRide buses, to save time. Sound Transit now expects to run its Bellevue-Seattle Route 550, serving 10,000 daily users, on downtown streets instead of an earlier option of dumping riders at International District/Chinatown light-rail station. Managers concluded that’s too much hardship for people who already lost the South Bellevue Park-and-Ride and I-90 express lanes. If not for the convention-center deal, Route 550 and other buses might have used the tunnel until 2020, when Sound Transit begins its practice runs for the Northgate rail extension. SDOT is defending car access, which Kubly said will be needed even as downtown’s growth is served mainly by transit and close-in housing. Under a leading One Center City option, Sixth Avenue would be redesigned as a busier two-way thoroughfare — offering a direct shot from Amazon’s campus in north downtown to I-5 near James Street. At the convention-center addition, sidewalks, landscaping and plazas are promised. The project would contribute about $10 million, to match a potential $20 million from the city’s waterfront project, to create a pleasant corridor from Capitol Hill past the convention center to Pike Place Market, predicted convention-center developer Matt Griffin. Some citizen activists have called for bolder moves, even a parklike lid above the freeway. The Seattle City Council will hear that view when it considers permits for developers to use city right of way. Metro always planned to eventually sell the Convention Place bus station, so it’s great to earn income for transit operations and wind up with a publicly owned convention facility, said Sung Yang, chief of staff for Constantine. Metro will be paid the first $20 million upfront in the first year, and that money can fund more bus service. Griffin said he hopes the project isn’t delayed by permit controversies. Every six months lost postpones $120 million in tourist business, and $17 million in sales-tax income, he said. “The other thing that I often think about is (that) we have $14 million going into subsidized housing” as part of the sales agreement, Griffin said. He reckons that at an average $100,000 subsidy per unit around the city, and with 1.3 people in each one, the land deal will fund well over 50,000 safe nights of sleep per year — another reason to get it done.